Back in 1992, the concept behind naming the successor to Pursue the Pennant “DYNASTY League Baseball” was to design the first baseball simulation game specifically for draft league players. A Fantasy Baseball “Dynasty” league is synonymous with “keeper” draft leagues that continue for more than one season. To start with there needed to be Official rules for draft leagues and those rules appeared back in 1994 during the launch of DYNASTY League Baseball. The DYNASTY League Baseball Official league rules are basically the Official Rotisserie rules adapted for Baseball simulations where an auction style bidding draft is held and players have contracts based on the dollar amount of the bidding. 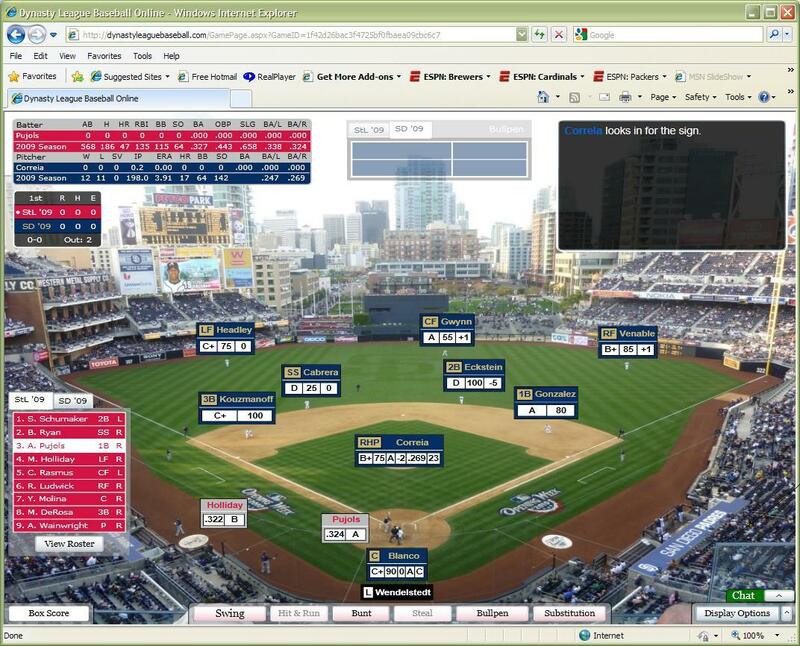 On February 1, 2013 the first real time Fantasy Baseball sim “Dynasty” leagues became a reality with a new update to DYNASTY League Baseball Online that allowed multi-player leagues to migrate seamlessly from one season to the next. Most new draft leagues will start with the newest season (2012) and continue forward, but there is now a new option to have historical Dynasty draft leagues that start with any year from 1996-2012 and continue forward. From the Commissioners tools league organization menu when you click on “Starting Player Season” you can now select any season from 1996-2012. Coming soon will be the ability to have a single season multi-player draft league with the 1957 or 1967 season. Coming after that you will have a choice to start your league with any season from 1967-1975 and eventually 1967-1982 or even possibly through 1985. The new migration code update on February 1 migrates your league organization, rosters and schedule from one year to the next in one click of the “Advance league” to the next player season button. Your private draft league history season-by-season can be found in the lower right-hand corner of your league page. You can select any year from 1996-2012 to start your private draft league. The new league migration feature combined with the real time draft leagues that update stats, standings, leaders and box scores automatically without having to import and export files to a central commissioner makes it a breeze to run your draft league with DYNASTY League Baseball Online. In the future will there be the option for leagues to conduct serpentine drafts instead of auctions? Right now there are no plans for serpentine drafts in the major league draft, but they are planned in the minor league draft per the Official DYNASTY League Baseball league rules. When 1957 Draft is available. Please contact me because I’m in. 1957 and 1967 Draft leagues will be available shortly as single season leagues. Eventually 1967 will be expanded to 1967-1975 and then 1967-1982. 1957, 1967, 1970, 1973-1974 and 1982 season leagues are now available. The next goal will be to complete consecutive run of seasons from 1967-1975. When will draft league starting in 1967 and go to now be available? Also when will yearly drafts be based on record and not bidding? The historical DYNASTY League Baseball Online will initially start from 1967 and go through 1975. Before that happens 1968, 1969 and 1975 have to be released and 1971 and 1972 have to be fixed. Yearly drafts are live auction style bidding drafts. You can’t base a typical fantasy style draft on record. What I meant was a keeper league that would start from 1967 and move forward and have a regular type draft. The league would start as a auction draft and then move on from there. Rookies would be assigned salaries(if necessary) based on what round they were selected in(slot salaries) kind of like MLB does now in a simpler version. What do you think? and can it happen? If a private draft league wanted to set it up that way, yes it would be possible.